we are leading suppliers & exporters of Velpatasvir and Sofosbuvir Tablets/medicine name tablets/capsules or injection in China, Russia, Hongkong, Bulgaria, Romania, India. Description - The Brand name of this medicine is Myhep all . 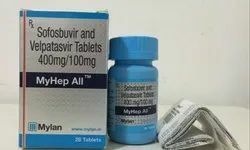 Myhep all medicine contains generic Velpatasvir and Sofosbuvir. Velpatasvir and Sofosbuvir are available in form of Tablets. Each Coated Tablet contains 100Mg Velpatasvir and 400 Mg Sofosbuvir. One Pack of Myhep all contains 28 Tablets. Manufacturer & Marketed company name of Myhep all is Mylan Pharmaceuticals Ltd, India. USED - Myhep All Tablet is used in the treatment of chronic hepatitis C virus (HCV) infection. Warning: Myhep all medicine out of the reach and sight of children and away from pets, never share your medicines with others, and use this medication only for the indication prescribed. The information contained herein is not intended to cover all possible uses, directions, precautions, warnings, drug interactions, allergic reactions, or adverse effects. Description - The Brand name of this medicine is Hepcvel . Hepcvel medicine contains generic Velpatasvir and Sofosbuvir . Velpatasvir and Sofosbuvir are available in form of Tablets. Each Coated Tablet contains 100 Mg Velpatasvir and 400 Mg Sofosbuvir. One Pack of Hepcvel 28 Tablets. Manufacturer & Marketed company name of Hepcvel is Cipla Pharma Ltd, India. 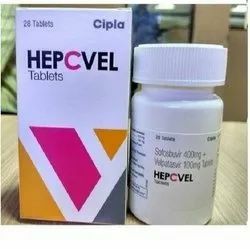 USED - Hepcvel is used in the treatment of chronic hepatitis C virus (HCV) infection, a viral infection of the liver. Warning: Hepcvel medicine out of the reach and sight of children and away from pets, never share your medicines with others, and use this medication only for the indication prescribed. The information contained herein is not intended to cover all possible uses, directions, precautions, warnings, drug interactions, allergic reactions, or adverse effects. Description - The Brand name of this medicine is Velakast . 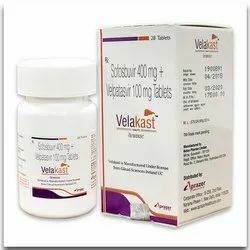 Velakast medicine contains generic Velpatasvir and Sofosbuvir . Velpatasvir and Sofosbuvir are available in form of Tablets. Each Coated Tablet contains 100 Mg Velpatasvir and 400 Mg Sofosbuvir. One Pack of Velakast 28 Tablets. Manufacturer & Marketed company name of Velakast is Prazer, India. USED - Velakast is used in the treatment of chronic hepatitis C virus (HCV) infection, a viral infection of the liver. Warning: Velakast medicine out of the reach and sight of children and away from pets, never share your medicines with others, and use this medication only for the indication prescribed. The information contained herein is not intended to cover all possible uses, directions, precautions, warnings, drug interactions, allergic reactions, or adverse effects. Description - Brand name is Velasof. Velasof medicine contains generic Velpatasvir and Sofosbuvir. 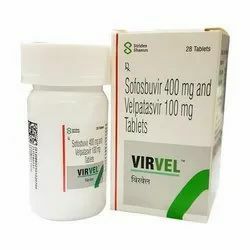 Velpatasvir and Sofosbuvir available in form of tablets. Each film coated tablets contains Velpatasvir 100mg and Sofosbuvir 400mg. One bottle of Velasof contains number of tablets is 28. Velasof each Tablet colours is Indigo carmine aluminum lake, Brilliant Blue FCF Aluminum Lake & Titanium Dioxide. Manufacturer company name of Velasof is Hetero, Marketed company name is Hetero India. USED - This medication is a combination of sofosbuvir and velpatasvir and is used to treat chronic (long-lasting) hepatitis C.
Delivery process - We can ship your medicine worldwide within 4-12 days through E.M.S. - Express mail service. Check courier company site for worldwide - You can contact us for complete details of order and delivery procedure. Warning: Velasof medicine out of the reach and sight of children and away from pets, never share your medicines with others, and use this medication only for the indication prescribed. The information contained herein is not intended to cover all possible uses, directions, precautions, warnings, drug interactions, allergic reactions, or adverse effects. Description - The Brand name of this medicine is Velpaclear . 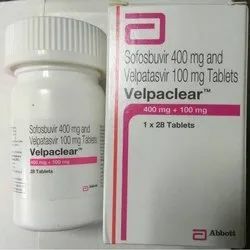 Velpaclear medicine contains generic Velpatasvir and Sofosbuvir . Velpatasvir and Sofosbuvir are available in form of Tablets. Each Coated Tablet contains 100 Mg Velpatasvir and 400 Mg Sofosbuvir. One Pack of Velpaclear 28 Tablets. Manufacturer & Marketed company name of Velpaclear is Abbott India Ltd, India. USED - Velpaclear is used in the treatment of chronic hepatitis C virus (HCV) infection, a viral infection of the liver. Warning: Velpaclear medicine out of the reach and sight of children and away from pets, never share your medicines with others, and use this medication only for the indication prescribed. The information contained herein is not intended to cover all possible uses, directions, precautions, warnings, drug interactions, allergic reactions, or adverse effects. Indications Do not change your dose or stop taking Velpanat medicine without checking with your doctor. Description - Brand name is velpanat. 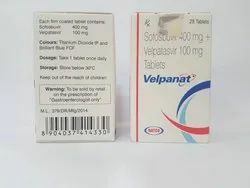 velpanat medicine contains generic Velpatasvir and Sofosbuvir. 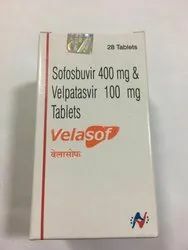 Velpatasvir and Sofosbuvir available in form of tablets. Each film coated tablets contains Velpatasvir 100mg and Sofosbuvir 400mg. One bottle of Velpanat contains number of tablets is 28. Valpanat each Tablet colours: Titanium dioxide IP and Brilliant Blue FCF. Manufacturer company name of Velpanat is Natco Pharma Ltd, Marketed company name is Natco Pharma Limited, Hyderabad, India. USED - Velpanat 400mg/100mg Tablet is used in combination with other medications such as ribavirin, daclatasvir and peginterferon to treat chronic hepatitis C.
Dosage- Take 1 tablet once daily. Warning: Velpanat medicine out of the reach and sight of children and away from pets, never share your medicines with others, and use this medication only for the indication prescribed. The information contained herein is not intended to cover all possible uses, directions, precautions, warnings, drug interactions, allergic reactions, or adverse effects. Description - The Brand name of this medicine is Virvel . Virvel medicine contains generic Velpatasvir and Sofosbuvir . Velpatasvir and Sofosbuvir are available in form of Tablets. Each Coated Tablet contains 100 Mg Velpatasvir and 400 Mg Sofosbuvir. One Pack of Virvel 28 Tablets. Manufacturer & Marketed company name of Virvel is Strides Shasun, India. USED - Virvel is used in the treatment of chronic hepatitis C virus (HCV) infection, a viral infection of the liver. Warning: Virvel medicine out of the reach and sight of children and away from pets, never share your medicines with others, and use this medication only for the indication prescribed. The information contained herein is not intended to cover all possible uses, directions, precautions, warnings, drug interactions, allergic reactions, or adverse effects.